Before traveling to another country it's a good idea to check what kind of sockets they use for power. This is important because they use different numbers and shapes of prongs as well as different voltages, and you will need to know what adapters to bring. Power adapters ensure that you get to charge your gadgets safely throughout the duration of your trip. Another thing to keep in mind is that not all adapters will work on all parts of Europe. Countries like Switzerland, Italy, and the United Kingdom require you to have a different kind of adapters. Here’s a short list of some of the best choices out there. No, this is not just a generic description of a travel adapter, it is the name of the product. The High Quality AC Power Travel Adapter is designed to work with Type E/F or Schuko plugs, making it suitable for travel to most European countries (except Switzerland, Italy, or the UK). The product is known for its durable makeup and distinct purple color, which makes it easy for you to spot – no more accidentally leaving your power adapter behind when you check out of the hotel. Weighing about 12.6 oz. (360 g), the adapter doesn’t add much to your baggage either. The dual ports make it possible for you to charge two devices at once. The plug is also designed to accept two-prong plugs, which comes in handy if you’ve brought appliances or devices from home. It also comes with a surge protector to prevent short-circuits due to voltage spikes. Not all devices are capable of switching smoothly between voltages, so it’s better if you can get an adapter that helps with that. Thankfully, the Foval Power Step Down Converter can convert 240V to 120V, making it easy for you to use a single voltage appliance while you’re in Europe without risk of damage. In addition to three removable adapters for the UK, US, and Australia, the converter also comes with a European power cable, so you can use this adapter on different trips. The Foval Converter is also designed to shut down in order to prevent overloading, short-circuiting, or over-heating. Measuring 4.8” by 3.1” by 1.5”, the converter is compact and ideal for travel. The 5-foot cord is detachable as well. Do you travel to all kinds of countries? Then you might want to invest in an adapter that you can even bring to non-European countries. The Iron-M All-In-One Universal Travel Adapter is perfect for travelers who plan to go to countries that don’t use the Type E/F plug. This adapter alone will let you charge your devices in over 150 countries. What’s more, the adapter also comes with two USB ports, allowing you to charge up to two devices via USB cable in addition to the single AC power socket. It’s CE, FCC, and RoHS safety-certified as well, so you know it’s good quality. While it is bulkier than most other adapters, its functionality makes up for it. This one is perfect for those looking for a no-frills model. The OREI European Schuko Type Plug Adapter is compatible with Type E/F plugs, making it a really cost-effective solution for those who are traveling to Europe and Russia (again, with the notable exception of Italy, Switzerland, and the UK). Also worthy of note is the fact that this adapter fits nicely into those circular sockets that can be found in Western Europe. Of course, they fit perfectly into the square-shaped ones as well. The adapter’s new internal metal interface promotes better conductivity, and it has a maximum capacity of 3,000 watts (up to 250V), allowing you to use some of your more power-hungry appliances such as hairdryers, unlike other adapters. The adapter can also charge two devices simultaneously. Ideal for those who use a lot of gadgets and require a lot of sockets, the PowerBear Charging Station can accommodate not only two AC devices but four USB cable devices as well – simultaneously! This means that you and your travel buddies can charge all your devices at once, which is especially useful for hotel rooms that offer limited electric sockets for charging. The adapter is ideal for those travelling in European and US countries because it comes with a European adapter as well. Two more adapters are also included, which you can use in the UK and Australia. As the name suggests, the Ceptics USA to UK Travel Adapter is meant for those who are planning to go to the UK, where your usual European adapters won’t work as the UK uses Type G plugs. The Ceptics Adapter also works in Cyprus and Gibraltar as well as British Overseas Territories and former British colonies. This is useful for other countries like Dubai and Hong Kong as well. This adapter comes in a pack of three, allowing you to make use of all the electric sockets in your hotel room at the same time. Each adapter has two inputs that can accommodate two or three-pronged plugs (US). Ceptics also offers a lifetime warranty on the product, so you can return damaged adapters and have them replaced for free. 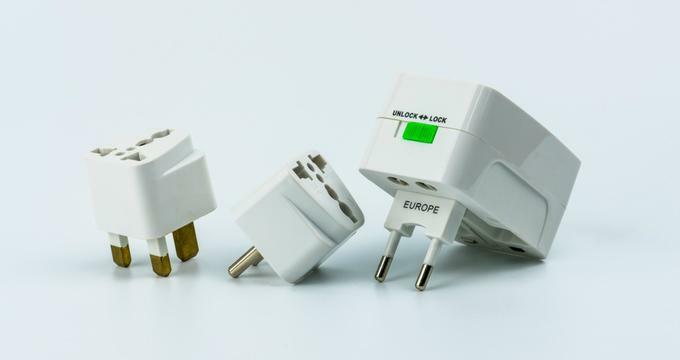 Most European adapters will work fine, but you need might to vary which one you use depending on where you want to go. Make sure you know your destination on your next trip before you finally purchase an adapter. Should you not be sure yet, go for the more universal ones or maybe invest in two or more types of adapters. Finally, don’t forget to think about your fellow travelers. Have enough adapters to make sure everyone stays powered up no matter where you go.